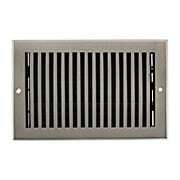 Baseboard (or wall) registers are mounted vertically on walls to accommodate heating vents that exit via the baseboard. 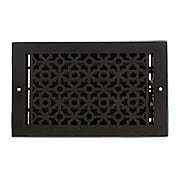 Many of our wall registers are also suitable as ceiling registers and include mounting screws for easy installation. Clean-lined and strong-boned, this Mid-Century style floor register is the ideal upgrade for your Atomic Ranch or rustic contemporary home. 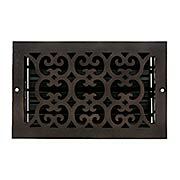 Cast from solid bronze and equipped with a heavy-duty steel louver, this premium design is built to last. Choose from a dark distressed bronze finish or satin nickel plated.